On 30 October, world powers meeting in Vienna agreed to a nine-point plan they hope will pave the way for a ceasefire in Syria - but they remain divided on what happens to President Assad. Russia is one of Syrian President Bashar al-Assad's most important international backers and the survival of the regime is critical to maintaining Russian interests in the country. It has blocked resolutions critical of President Assad at the UN Security Council and has continued to supply weapons to the Syrian military despite international criticism. Moscow wants to protect a key naval facility which it leases at the Syrian port of Tartous, which serves as Russia's sole Mediterranean base for its Black Sea fleet, and has forces at an air base in Latakia, President Assad's Shia Alawite heartland. In September 2015 Russia began launching air strikes against rebels, saying the so-called Islamic State (IS) and "all terrorists" were targets. However, Western-backed groups were reported to have been hit. President Vladimir Putin has though said that only a political solution can end the conflict. The US has accused President Assad of responsibility for widespread atrocities and says he must go. But it agrees on the need for a negotiated settlement to end the war and the formation of a transitional administration. The US supports Syria's main opposition alliance, the National Coalition, and provides limited military assistance to "moderate" rebels. Since September 2014, the US has been conducting air strikes on IS and other jihadist groups in Syria as part of an international coalition against the jihadist group. 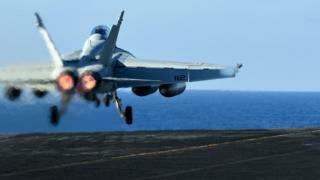 But it has avoided attacks that might benefit Mr Assad's forces or intervening in battles between them and the rebels. A programme to train and arm 5,000 Syrian rebels to take the fight to IS on the ground has suffered embarrassing setbacks, with few having even reached the frontline. The Sunni-ruled Gulf kingdom says President Assad cannot be part of a solution to the conflict and must hand over power to a transitional administration or be removed by force. Riyadh is a major provider of military and financial assistance to several rebel groups, including those with Islamist ideologies, and has called for a no-fly zone to be imposed to protect civilians from bombardment by Syrian government forces. Saudi leaders were angered by the Obama administration's decision not to intervene militarily in Syria after a 2013 chemical attack blamed on Mr Assad's forces. They later agreed to take part in the US-led coalition air campaign against IS, concerned by the group's advances and its popularity among a minority of Saudis. The Turkish government has been a staunch critic of Mr Assad since the start of the uprising in Syria. President Recep Tayyip Erdogan has said it was impossible for Syrians to "accept a dictator who has led to the deaths of up to 350,000 people". Turkey is a key supporter of the Syrian opposition and has faced the burden of hosting almost two million refugees. But its policy of allowing rebel fighters, arms shipments and refugees to pass through its territory has been exploited by foreign jihadists wanting to join IS. Turkey agreed to let the US-led coalition against IS to use its air bases for strikes on Syria after an IS bomb attack in July 2015. They have though been critical of coalition support for the Syrian Kurdish Popular Protection Units (YPG) - an affiliate of the banned Turkish Kurdistan Workers' Party (PKK) deemed a terrorist group by Turkey, the EU and the US. Regional Shia power Iran is believed to be spending billions of dollars a year to prop up President Assad and his Alawite-dominated government, providing military advisers and subsidised weapons, as well as lines of credit and oil transfers. Mr Assad is Iran's closest Arab ally and Syria is the main transit point for Iranian weapons shipments to the Lebanese Shia Islamist movement, Hezbollah. Iran is also believed to have been influential in Hezbollah's decision to send fighters to western Syria to assist pro-Assad forces. Militiamen from Iran and Iraq who say they are protecting Shia holy sites are also fighting alongside Syrian troops. Iran has proposed a peaceful transition in Syria that would culminate in free, multi-party elections. It was involved in peace talks over Syria's future for the first time when world powers met in Vienna.